Ingrid Levin-Hill, the 13-year-old super sleuth of Down the Rabbit Hole, Behind the Curtain, and Into the Dark, has officially become my favorite heroine in all of YA literature. I know, that’s a bold claim. I adore Ingrid, and I adore these books. 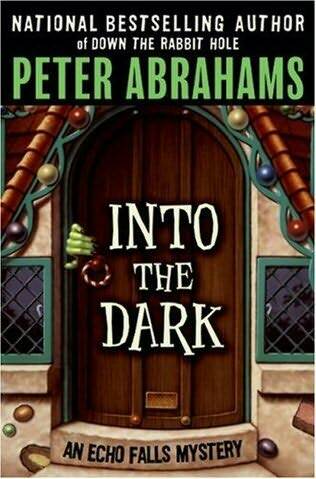 I just finished Into the Dark, the third in the series, and it is excellent. I thought it was much darker than the first two, with some big family revelations, but still with those fully realized characters I’ve come to know and love. Grampy, Joey Strade and his dad The Chief, Ingrid and her dog Nigel–I love them all. Echo Falls is the kind of town you wished you lived in, with people you wish you knew. Besides all the murders that seem to happen there, of course. A couple of weeks ago, there was a lot of discussion about the 100th anniversary of Anne of Green Gables. Liz B over at A Chair, A Fireplace, & A Tea Cozy pointed us readers at the Newsweek article “It’s Not Easy Being Green,” which she heard about from Sarah Rettger. The article suggests that best sellers don’t have strong heroines anymore. Sarah and Liz started an excellent list of all the smart heroines in teen lit today, and I add Ingrid to the list. She is resourceful, family-focused, sassy, real, and fully the star of these books. 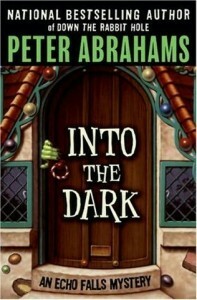 I hope Peter Abrahams is sitting in front of his computer right now writing another one. This very minute…any second now….